I have been a fan of Clark Howard of The Clark Howard Show for over ten years. I love the advice he gives and respect his principles of free market without being a predator. However, lately my admiration has been tainted. Below is a communication between myself and the Clark Howard team at ClarkHoward.com. Subject: Clark Howard Fan Confused About Website Promotion of QuiBids? I have been a fan of Clark for over 10 years now. My parents were avid AM Talk-Show listeners, and by proxy, I became one as well. I started listening to Clark when I was 20 and working at a telemarketing company. The show was re-broadcast at night and from the start, the information was interesting and educational. In fact, I wish I had followed Clark’s advice more often in the last 10 years. Which brings me to an observation I have had about the website. QuiBids is a sponsor on the site. QuiBids is a penny auction site. I have followed their model and even written an article on http://www.theperegrinfalcon.com before I read Clark’s take on those types of sites. I find it disturbing that the “consumer advocate” that I have admired for all these years, would allow such a nefarious company to be a sponsor, especially after coming out against them. That would be like Clark endorsing phony visas, or praising At& t’s business practices; it just does not ring sincere. I understand every website that generates revenue has to have a sponsor or a product to sell to maintain it. However, I expect more from Clark. Subject: RE: Clark Howard Fan Confused About Website Promotion of QuiBids? QuiBids is actually not a paying advertiser. They are buying unsold inventory via Google and so their ads are being placed on our site (along with countless other sites) based on keywords that appear on our page. Hence, when we have a page on our site that warns people away from penny auctions, their ads appears, probably because they’ve told Google to associate their ad with any page that mentions the ‘penny auctions’ keyword. Team Clark, Thank you for your reply. I did not realize, or see, that these ads were Google ads. However, is it not under your direct control whether to use Google ads in your site content? I know I can control the various websites I pay for. I would still think that this is a principle v. profit scenario where in the purveyor (Clark Howard) makes a call to stop using a vendor because of a practice that is contrary to the business’s stated goals and practices. (e.g. “consumer advocacy”) After all, Clark calls companies to the carpet when their vendors or practices hurt or encourage hurt to their patrons. While I accept your explanation and Clark’s, it rings a little hollow to say “hey, it’s not MY fault it’s Google’s” when clearly the decision is up to the owner to use or not use Google Ads as a source of revenue. I would say this is akin to having a daily ad paper available to your customers in your shop that advertises adult material and then telling clients with children, that it is the paper’s fault for the content not yours. Maybe if enough large sites like you took a principled stand, Google would give control to the host site as to who to allow or block. I expect this kind of answer from everyday website hosts, who just put up ads to make money and could care less about content, but this is not any website and Clark is not any content. I am seriously questioning whether I recommend ClarkHoward.com as a resource now. I hope that this letter has caused at least some discussion for reconsideration. I will publish any reply that I get back from The Clark Team. So far no word from Team Clark about my last post. Unfortunately, it appears I have won the argument. Which means that the radio game is the same for all of those who play, its about revenue, not necessarily principle. I guess the hard reality is, no matter who says they are for the little guy, or Joe Public, when they back up a truck load of money to your house; it is hard to say no. I don’t have anything against making money, being a good capitalist, or even truck loads of money (heck, I wish I had a few!). I do however, have a problem with someone who calls themselves a champion of something and then promptly sells-out with a shrug of the shoulders. From now on, both Dr. Michael Savage and Mr. Clark Howard will only get half my ear, as the other half will be filtering for ad content. So, my original supposition is true. Sites could be blocked from advertising on a site that uses the Google Ad box. If Google has the ability to block specific URLs, then they could extend that ability to ads. However, it would take a consumer force, those who have Google Ads on their sites or those who click through the ads, to tell Google to allow those who use Google Ads to block ads/content and links. In addition, my second supposition is true. The show has some control over which advertising avenues to pursue. Since Google Ads has been chosen as a free way to deliver content to potential consumers, it can also be un-chosen. Now the question is why are the “penny-auctioneers’” URLs not blocked? In my opinion, it is a complete fraud. They tell you “you’re a winner” when you have not won. They tell you a laptop sold for $1.99 when in reality they earned well over $100.00 in bid costs and final price. In all reality, the “penny-auction” is no auction at all; rather it is a gambling site and should be advertised and treated as such. The definition of a legitimate business on the internet seems to be a grey area, and in this case, a penny-auction site that advertises itself as an EBay is not legitimate. I cannot count how many people I know personally who thought these sites were legit ways to purchase goods for 1/100th the value of an item. Including, another radio favorite of mine, Michael Savage; who promotes BeeZid.com on his show. You are correct that we all have individual choice to frequent or not frequent a business. In fact, that is the very basis of my concern. The administration of the site has the choice to allow the QuiBids of the world access to their audience, and that choice has been made. Hi- as we do our best to mention frequently–while we can’t control which ads pop into the Google ad box, we do have the ability to block any scam-related links that might display. We rely on our site users to help alert us to anything offensive, because their search histories may “reveal” ads that don’t necessarily display to us. We block URLs that are known scams, but it’s a bit like playing whack-a-mole, since scammers are very good about creating new links all the time. An ongoing process for sure. 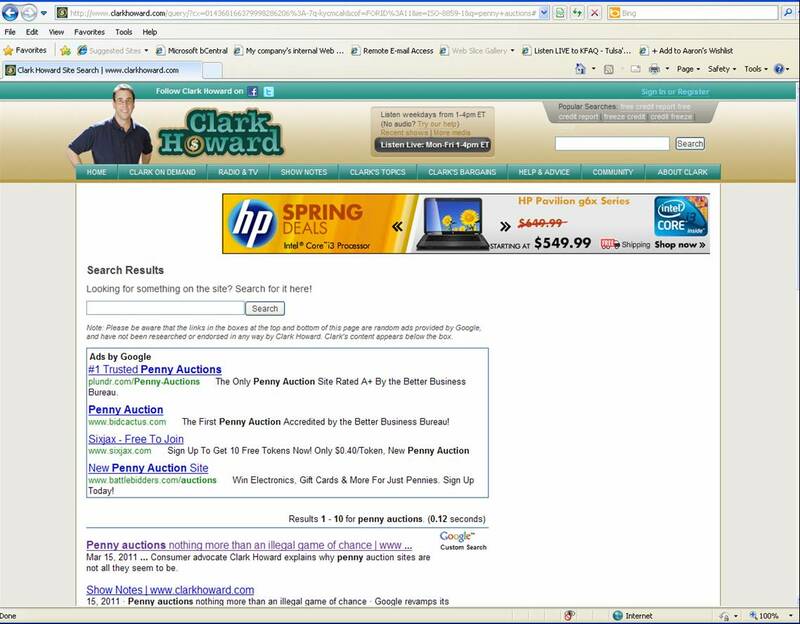 This site utilizes Google Ads as a measure to allow us to provide Clark’s content, newsletters, consumer help services & call centers FREE to the public. As you know, not all consumer sites offer their content and services for free, but this is one way we assure that. We encourage everyone to email any offensive scam advertisers they see to chsite@clarkhoward.com. Thanks! Excellent points, however, we are just the webmasters who do content updates on a daily basis. 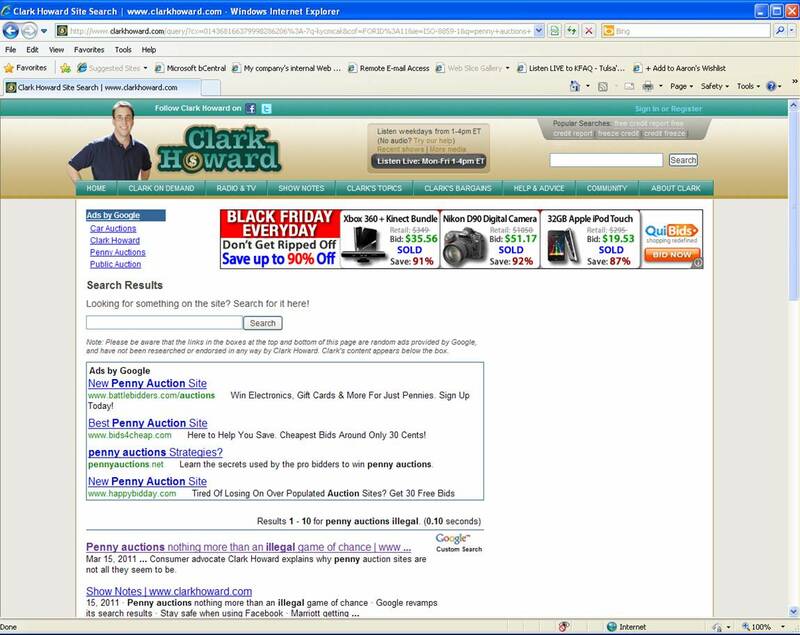 The decision to use Google ads goes well above our heads, to the very top of the joint venture between Clark Howard and Cox Radio that is ClarkHoward.com. Are you aware of our Clark Stinks forum? Yours would make a great post for our Clark Stinks forum. Free registration is required before posting. Once a week, our producer goes through the entries and reads about a dozen or so to Clark on the air for him to respond.